Custom Dynamics® Flat Bezel Turn Signal Adapters are designed to convert ProBEAM® bullet or flat style LED turn signal inserts to the custom flat bezel style for installation on 1986-2013 Electra Glide® Models, 1986-2019 Road King® models (Except Road King Special), 1986-2017 Heritage Softail®, 1999-2003 Road Glide® & 2005 Road Glide® Classic. The Flat Bezel Turn Signal Adapters are comprised of a die-cast bezel finished in chrome or gloss black with a red or smoked inset lens. Matching installation hardware also included. The ProBEAM® Flat Bezel Turn Signal Adapters attach to the ProBEAM® bullet LED turn signal using a modular tab design. The metal tabs are pushed down by hand to secure the LED cluster inside the Flat Bezel, then attached to the Harley-Davidson® OEM flat turn signal housing with 2 screws. Must be used with Custom Dynamics® ProBEAM® LED Turn Signals (sold separately). ProBEAM® Amber/White Front Turn Signals are DOT and SAE compliant when used with ProBEAM® Smoke Lenses. ProBEAM® Red Rear Turn Signals are DOT and SAE compliant when used with ProBEAM® Smoke or Red Lenses. ProBEAM® Flat Bezel LED Turn Signals also available as complete assembly; includes LED turn signal and ProBEAM® Flat Bezel Turn Signal Adapters. Custom Dynamics® Flat Bezel Turn Signal Adapters are designed to convert ProBEAM® bullet style LED turn signal inserts to the custom flat bezel style for installation on 1986-2013 Electra Glide® Models, 1986-2019 Road King® models (Except Road King Special), 1986-2017 Heritage Softail®, 1999-2003 Road Glide® & 2005 Road Glide® Classic. Must be used with Custom Dynamics® ProBEAM® Bullet LED Turn Signals (sold separately). ProBEAM® Amber/White Front Turn Signals are DOT and SAE compliant when used with ProBEAM® Smoke Lenses. ProBEAM® Red Rear Turn Signals are DOT and SAE compliant when used with ProBEAM® Smoke or Red Lenses. Custom Dynamics® Flat Bezel Turn Signal Adapters must be used with Custom Dynamics® ProBEAM® Bullet LED Turn Signals (sold separately). ProBEAM® Amber/White Front Turn Signals are DOT and SAE compliant when used with ProBEAM® Smoke Lenses. ProBEAM® Red Rear Turn Signals are DOT and SAE compliant when used with ProBEAM® Smoke or Red Lenses. Water (or any moisture) in your turn signal is a problem. 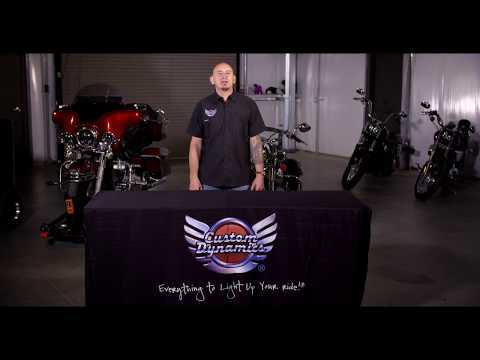 Learn how the new ProBEAM® turn signal lens design alleviates the issue completely!